There are many amongst us who were born lucky. Not in the sense that they have managed to predict the winner of the last seven Kentucky derbies or have evaded the grim reaper several times like the plucky protagonists in the Final Destination movies. No, the luck I am referring to is a much more basic kind. It is the kind that lets you stroll around on glorious summer days with not even a second thought on how best to stop yourself cooking under the suns rays. Being fair skinned with Celtic heritage, I do not enjoy such luck. Summers are spent trying to find the shady part of each and every sidewalk on my way to work or making sure I’m in possession of some seriously high factor sun block. This makes certain shindigs problematic. Sunblock is definitely an effective weapon in my never ending fight with that big fireball in the sky but it’s not too conducive to picnic finger food. Invariably, all you start experiencing after a while is some pretty disgusting chemical tasting appetizers. This is why one of my most essential picnic items is the pop up canopy or pop up tent. With this item I can now spend hours outside if needs be without having to seek refuge away from where all the good stuff is taking place. Canopy tents are especially good for picnics as they are a non-bulky item. You could easily replace a tent with a massive sports umbrella but they tend to be large items that are quite cumbersome and difficult to carry, especially if you already have a lot of picnic extras. Pop up tents are generally folded up to something the size of a purse and more often than not can be thrown over the shoulder to free up some all important hand space. It’s not only the sun that these tents will shield you from either. 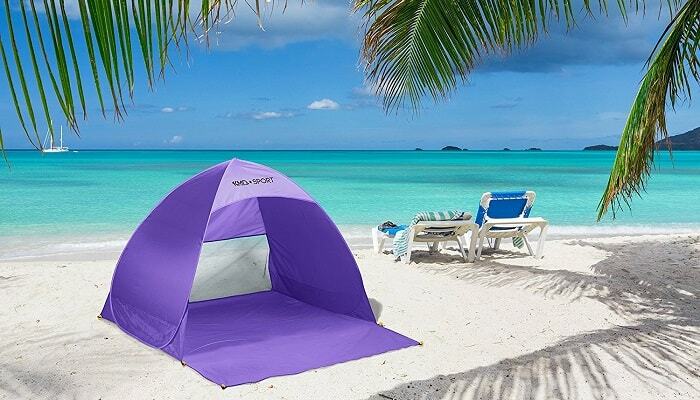 If you are enjoying a nice beach picnic with loved ones but the wind, as it does on the coast, is playing havoc with your plans by sending sand flying everywhere, the pop up tent will provide you with a barrier that protects your food, your eyes and basically anything else that sand likes to get into. Choosing a tent or canopy to suit your needs is a fairly straightforward affair although there are some things that you might want to keep in mind. Things like knowing that due to the nature of pop up tents they are not going to be the biggest of items when fully erected. You will definitely be able to fit 2 adults into the vast majority of them but you will start struggling after that if you intend to use it for more people. Another thing to consider is if you opt for a picnic canopy then you will need a sturdy option which in turn means thicker, better quality poles which means a heavier weight to possibly carry around. These are things that can all be resolved with a little research however and below you will find I have started the research for you. Please, have a look, take some inspiration and maybe let us know in the comments your picnic canopy / pop up tent experiences. The beach pop up tent by KMD Sport is as good a tent as any to start us off. It is a true pop up tent meaning set up time is mere seconds. It is made from double type B interwoven mesh which has a silver coating on it which provides protection from UV rays. When fully set up it measures 45x56x62 inches. These measurements provide both a deep and tall space that gives ample room for you to go about your leisure. As with all pop up tents, people can get frustrated when packing it away but as long as you read the provided instructions and follow them exactly you should have no problems. An alternative to the above tent by KMD is this Easy Up Beach Tent by Pacific Breeze. It is a bit more expensive but for the extra money you get a few great features, none being more impressive than the speedy packing away time. This saves on any frustrations you might feel with other pop up tents. Check out the video below to see how easy assembly and disassembly is. The payoff here is that it is bigger than its competitors when packed down but it does come with its own carry case that can be thrown over your shoulder. Other features include large windows for ventilation, UPF 50+ sun protection and sand pockets and stakes for tethering to the ground if so required. The XL version offers a ridiculous amount of space if you need to fit some more people in. Canopies don’t all have to be 10×10 foot. They obviously provide enormous amounts of shade for you to enjoy but the problem is they’re not exactly easy to transport or carry. Thankfully, the Beach SunShade by ZiggyShade is a picnic canopy that is easy to assemble and highly portable. It comes in 2 sizes; family and standard which measure 7.2×7.9 and 5.25×6.55 respectively. Both stand at around 5.75 feet tall and can be rolled up to the size of a yoga mat. It comes with sandbag anchors for use at the beach and 4 pegs for use at the park. 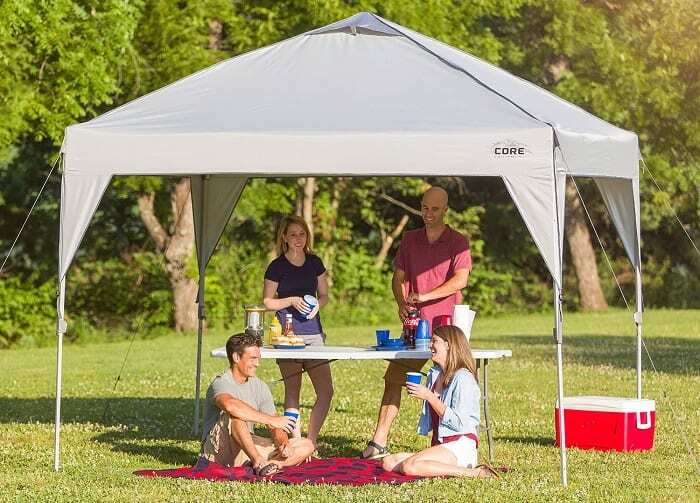 The shade is adjustable so no matter the angle of the sun you can always set the canopy up to cover yourself. If you are hosting a larger picnic and you don’t mind a bit of setting up time then the larger canopies will appeal to you more. The 10×10 foot Instant pop up canopy by Core Equipment is one that might suit your needs. As it is a pop up, assembly time is kept to a minimum and the oversized pinch free buttons means that even the most clumsy cannot fail to safely erect it. The canopy offers 50+ UV protection and comes with fully taped seams for weather protection. It is a large item and weighs in at 43 pounds but it comes with a wheeled carry bag which should take a bit of the strain when transporting.